Pleasanton is a charming, affluent city situated in the Tri-Valley region of Northern California’s Bay Area. It’s home to more than 70,000 residents and conveniently located about 40 miles east of San Francisco and 25 miles east of Oakland. Pleasanton is served by Interstates I-680 and I-580. 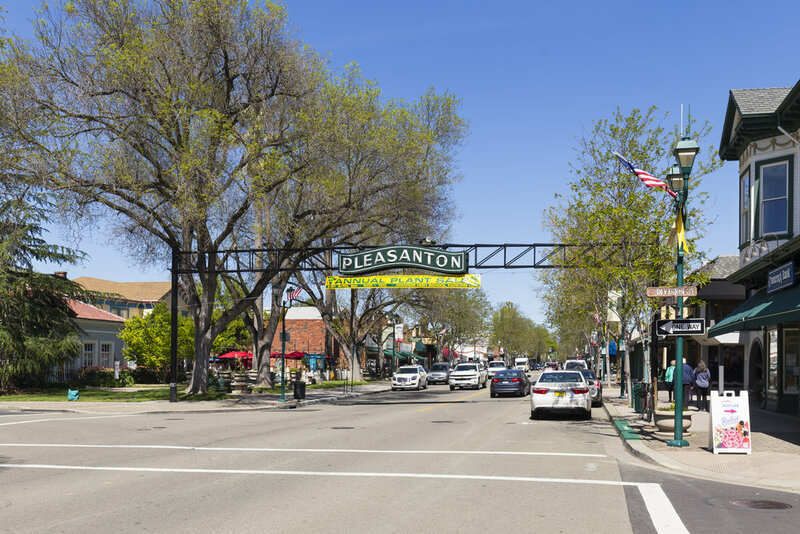 A major suburb of the San Francisco Bay Area, Pleasanton has been ranked as one of the wealthiest middle-sized cities in the nation by the Census Bureau. Pleasanton’s intimate-feel, historic downtown offers its residents endless amenities, including unique boutiques, shopping, arts/cultural functions and leisure activities, as well as more than 220 dining possibilities ranging from specialty cafes to upscale restaurants. Noted for its ‘Top 10’ school system ranking in California, Pleasanton is a natural draw for families with children. Spending quality time outdoors is effortless, with convenient access to 1,200+ acres of beautiful parks and lush, open spaces and trails, complete with stunning vistas. Dubbed a Cal-Ital Winery, Rubino Estates boast a rich Italian heritage linked to Italian immigrant Ernest Ferrario, who purchased Ruby Hill in 1921 and developed the land into a splendid vineyard. Production was limited during prohibition and a fire destroyed the winery in 1989. In 2002, Mike Callahan purchased the property and lovingly restored it to the exact replica of the original winery building. Owned and operated by three families, Rubino Estates Winery is now regarded as one of the highest- quality vineyards in the Livermore Valley with a strong commitment to quality and sustainability. Amenities include a restaurant, bocce ball, library reserve tastings, and event facilities. One of Livermore Valley's original wineries, Ruby Hill specializes in estate-grown red blends. Founded in 1883, Ruby Hill Winery was resurrected by Mike Callahan in 2002 and features reasonably priced, award-winning wines. The winery is located in a special microclimate that allows the vines to thrive. Amenities include the Mello Cielo Vineyard Experience, which is a comprehensive, two-hour excursion through the vineyards and winery production facilities on the estate's customized bus. Callippe Preserve is an award-winning, 18-hole, par 72 golf course nestled in the valley floor and framed by large oak trees. The course is challenging with "unique and memorable holes," not the least of which is par 5 number 18, touted as "one of the most strategic and dramatic closing holes in the Bay Area." The grounds feature a creek and strategically placed bunkers. Callippe Preserve is also a premier destination for weddings and events. Located in the middle of the horse racetrack at the Alameda County fairgrounds, Pleasanton Golf Course is perhaps one of the most unusual golf courses in the Bay Area. The 9-hole Pleasanton Fairways Course is comfortable for players of all ages and abilities. Playing time is just two hours with day tournaments running half a day. The course also features a warm-up range and grass tees. A European-style, boutique hotel in the heart of Pleasanton, The Rose Hotel offers "the friendless of a bed and breakfast and the luxury of a fine hotel." It is conveniently located near numerous restaurants, upscale shops, art galleries, and salons. It is also near the Shadow Cliffs Regional Recreation Area and within one mile of Pleasanton Golf Center and Alameda County Fairgrounds. The deluxe rooms and suites are tastefully designed and include complimentary amenities. The expansive Rose Hotel Boardroom is available for meeting, events, and presentations. Larkspur Landing Pleasanton is a home-suite hotel that is ideal for extended stays for both business travelers and vacationers alike. Each all-suite accommodation features a fully equipped kitchen and separate living and sleeping spaces. The hotel offers a state-of-the-art corporate meeting space for up to 60 people. Centrally located in the Bay Area, it is just minutes away from wine country and popular area attractions. Hap's Original is a classic New-York-style steak and seafood house that specializes in preparing dry-aged cuts of beef and fresh seafood. The restaurant features an award-winning wine list of 300+ wines from around the world with a focus on California, Washington, and Region wines. Loved by locals as one of the best restaurants on Main Street, Nonni's Bistro is a cozy French bistro located in the heart of Pleasanton. Chef Jon Magnusson, who is originally from Iceland and a longtime world traveler, opened his first bistro in Carmel, Bistro 211. Nonni's Bistro, opened in 2010, is his most recent culinary venture and has quickly become a favorite of both locals and visitors. Pleasanton is well known for its excellent public schools, making it a very desirable place to live for the families with children.